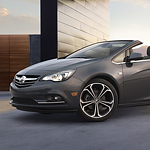 Along with the Cascada’s different wheels, a key performance feature is its central chassis. This chassis is tuned to be rigid, letting the wheels and the engine truly dictate how you drive the car. This feature allows the vehicle to be truly dynamic on the road, able to dart between lanes and accelerate with ease. Make sure you give the Buick Cascada a test drive so you can experience these outstanding performance features.